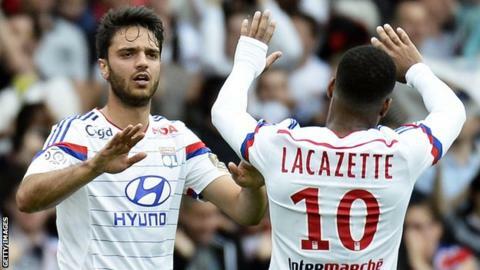 Lyon kept the pressure on Paris St-Germain as they regained top spot in Ligue 1 with victory over Evian. Midfielder Clement Grenier, having recently returned from injury, put Lyon ahead when he curled in a free-kick from the corner of the box. Lyon striker Alexandre Lacazette added a second with a penalty after Corentin Tolisso brought down Dany Nounkeu. PSG will go three points clear of Lyon, who are top on goal difference, if they win away at Nantes on Sunday. In Saturday's other matches, Bastia moved six points clear of the relegation zone with a 1-0 win over St Etienne and Lorient climbed to 15th with a vital point from their goalless draw at home to Bordeaux. Reims remain a point above the bottom three after a 2-0 loss at Guingamp, while fellow strugglers Caen battled to a 1-1 draw with Nice. Montpellier's hopes of a Europa League spot suffered a blow after a 0-0 draw with Rennes. Match ends, Lyon 2, Evian Thonon Gaillard 0. Second Half ends, Lyon 2, Evian Thonon Gaillard 0. Corner, Lyon. Conceded by Dany Nounkeu. Attempt blocked. Nabil Fekir (Lyon) left footed shot from outside the box is blocked. Assisted by Jordan Ferri. Attempt saved. Nabil Fekir (Lyon) left footed shot from the right side of the box is saved in the centre of the goal. Assisted by Steed Malbranque. Clarck N'Sikulu (Evian Thonon Gaillard) wins a free kick in the attacking half. Attempt blocked. Steed Malbranque (Lyon) right footed shot from the centre of the box is blocked. Assisted by Nabil Fekir. Substitution, Lyon. Steed Malbranque replaces Maxime Gonalons. Attempt missed. Corentin Tolisso (Lyon) header from very close range is too high. Assisted by Clément Grenier with a cross following a corner. Corner, Lyon. Conceded by Cédric Cambon. Attempt blocked. Nabil Fekir (Lyon) right footed shot from a difficult angle on the right is blocked. Assisted by Maxime Gonalons. Alioune Fall (Evian Thonon Gaillard) wins a free kick in the defensive half. Corner, Evian Thonon Gaillard. Conceded by Bakary Koné. Christophe Jallet (Lyon) wins a free kick in the defensive half. Foul by Alioune Fall (Evian Thonon Gaillard). Attempt missed. Nabil Fekir (Lyon) left footed shot from the right side of the box is too high. Attempt saved. Nicolás Blandi (Evian Thonon Gaillard) right footed shot from outside the box is saved in the bottom left corner. Substitution, Lyon. Mohamed Yattara replaces Alexandre Lacazette. Attempt saved. Nabil Fekir (Lyon) left footed shot from outside the box is saved in the top right corner. Foul by Dany Nounkeu (Evian Thonon Gaillard). Offside, Lyon. Maxime Gonalons tries a through ball, but Alexandre Lacazette is caught offside. Attempt missed. Clarck N'Sikulu (Evian Thonon Gaillard) header from the centre of the box is close, but misses to the right. Assisted by Adrien Thomasson with a cross. Substitution, Evian Thonon Gaillard. Djakaridja Koné replaces Gilles Sunu. Delay in match Adrien Thomasson (Evian Thonon Gaillard) because of an injury. Adrien Thomasson (Evian Thonon Gaillard) wins a free kick in the attacking half. Attempt missed. Gilles Sunu (Evian Thonon Gaillard) header from the centre of the box is too high. Assisted by Alioune Fall with a cross. Clément Grenier (Lyon) wins a free kick in the attacking half. Attempt missed. Yeltsin Tejeda (Evian Thonon Gaillard) right footed shot from outside the box is high and wide to the right. Substitution, Lyon. Jordan Ferri replaces Clinton N'Jie because of an injury. Delay in match Clinton N'Jie (Lyon) because of an injury. Substitution, Evian Thonon Gaillard. Nicolás Blandi replaces Mathieu Duhamel. Offside, Lyon. Corentin Tolisso tries a through ball, but Clinton N'Jie is caught offside.